Anyone grown these? I bought a package of them at the store yesterday. They look like miniature bell peppers. There is red, yellow, and orange. I opened one and there is seeds but very little. I got a bag of those at Costco last year or the year before. They grew the same peppers but smaller. (which could have been my own fault, it was a particularly hot and dry year). They were good, taste just like bell peppers. But so small I had to use about 6 or 8 of them to put on an italian sausage sub. I like a lot of peppers, but that's a lot of cutting. I decided not to do them again because they were so small. On the up side, they did seem particularly pest and disease resistant. I don't remember a single bug bothering them. But then again hardly anything ever does bother my pepper plants for some reason. I probably just cursed myself for next year. I may do them in a pot. How big did the plant get? What size pot do you think is adequate? I used a handful of Yummy peppers for a casserole yesterday and another handful for a pot of chowder, today . The seed for the Yummies came from the Jung Seed Company. (click) About 10 or 12 years ago, Jingle Bells were in my garden but they didn't perform nearly as well as the Yummies. This was not much of a pepper year. It was a record cool start to the growing season. Still, the Yummies grew as well as any of the other pepper varieties. They were the only sweet peppers that matured - or, many of them did. I picked them a little early fearing a frost but most ripened in the kitchen. Despite a cool start, the fall frost came very late. If not good, it turned out to be a fair year for all the peppers. The Yummy plants really were covered with fruit. An added plus with them was that the fruit has very few seeds. They are not listed as a hybrid so, I suppose you could save whatever seed they produce for next year's plants. Yeah I figured they were probably like regular pepper plants but the only difference was the fruit size was smaller. These may be yummie peppers. They look just like it and according to the description from the link they taste like that. I saved some seeds from each color. Maybe hang onto them for one year when I feel like growing them. Who knows maybe I will try them next year. Marlin is right, they were a prolific yield~er! I got lots off of just one or two plants. I have never had luck with regular bell pepper plants so now you have me thinking about trying them again lol. They put out even more peppers than my jalapeno plant! 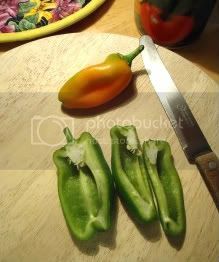 In my years of gardening I have only ever gotten 2 bell peppers, and they were in the same year. And whats more, I was expecting them to get bigger, left em on the plant too long and they got over ripe. Other than that I only get as far as flowers on my bells. Yeah maybe I will do those again. It's nice to have something besides the scorchers that seem to just dump out of the ground for me.